Description: Japanese reissue CD! DSD remastered! 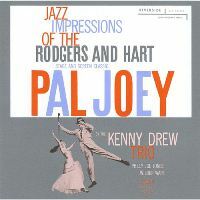 Kenny Drew recorded this superb trio album for Riverside in 1957, subtitled "jazz impressions of the Rodgers and Hart stage and screen classic". With bassist Wilbur Ware and drummer Philly Joe Jones, Drew interprets the very famous eight songs with memorable melodies with swing and bop-based improvisation. A classic jazz piano trio album cherished by many jazz fans! Recorded October 15, 1957 in New York. Mono. DSD remastering.